Bob Heft passed away on December 12, 2009. The major news media outlets did not report his passing at all. Only the media local to his residence bothered to report the news. I just found out yesterday (December 29) ... and by chance. 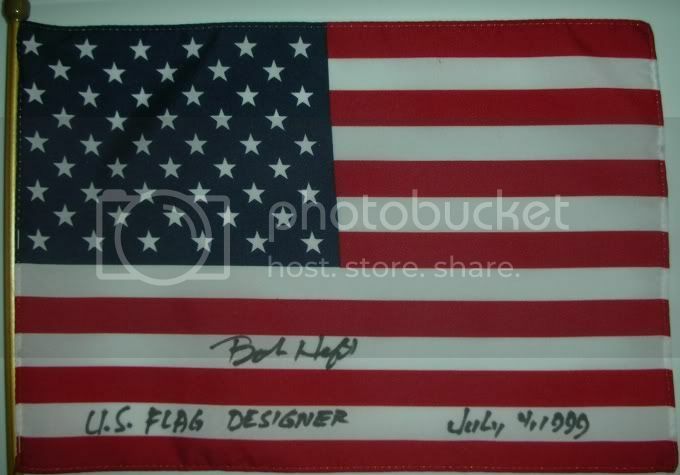 Bob was such an important figure to this country - he was the one who came up with the design of our current Flag and his death came by without mass acknowledgement. Really - all of us need to hang our heads in utter shame for this. There are some funny stories associated with Bob's life. 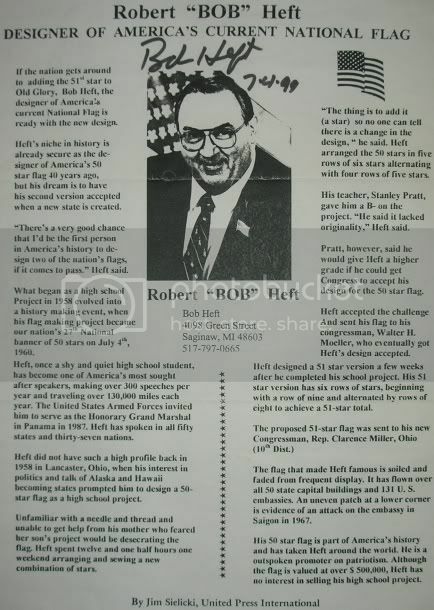 At the age of 17, Bob created the Fifty-Star Flag as a project in high school. He believed two additional states would join the Union at some point. He received a B- for his work since in his teacher's words, "It lacked originality". Bob wanted an A and his teacher told him if Congress accepted his design, he would increase his grade to an A. It indeed happened. The President at the time, Dwight David Eisenhower, called Bob and asked for Robert G. Heft. Not knowing he was speaking to the President, he replied, "Yes, but you can call me Bob". Furthermore when DDE asked him if he could come to Washington a few days before the official presentation of the Flag, he put the President on hold so he could ask his boss about it (Heft was only at his job for eleven days and, therefore, did not have any leave time). Shocked at the fact that Heft put the President on hold, his boss told him he could have the days off. Bob Heft then picked up the phone and said, "Dwight, are you still there?". The people in the room with him laughed. I have wanted to meet Bob Heft for some time now, but I was never able to work it out. He actually visited Frank Woodruff Buckles (America's last surviving Veteran of World War One) a few days after I met him back in January. An extremely important person involved in the history and culture of America has died and it went by with little-to-no recognition. We are about to enter a new decade. Let us make a commitment to not let the passing of such a significant figure go by with such apathy and reticence. We can do better America. Here are some autographed items by Bob Heft from my collection. You can find more information about Bob Heft by typing his name into search engines and youtube.